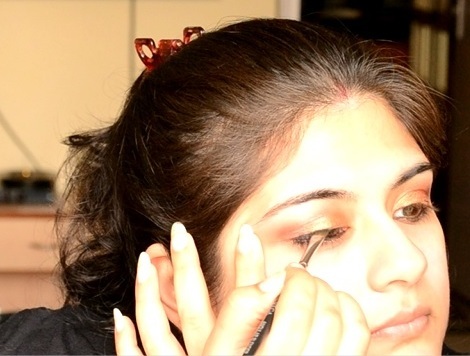 Bridal makeup is not always about wearing a red lip or a bright pink lip or a lot of gold and shimmer on the eyes and face. 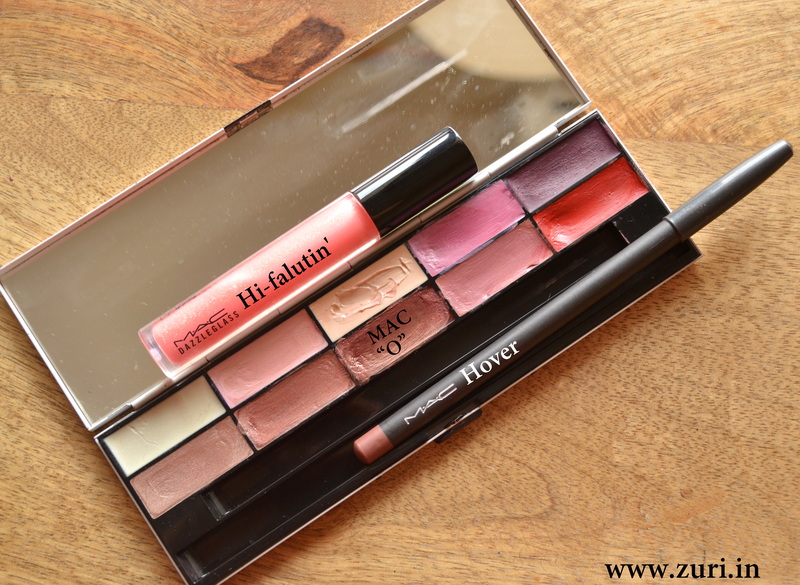 It can also be worn simple with beautiful soft colors on the eyes with a ‘not-so-loud’ lip. 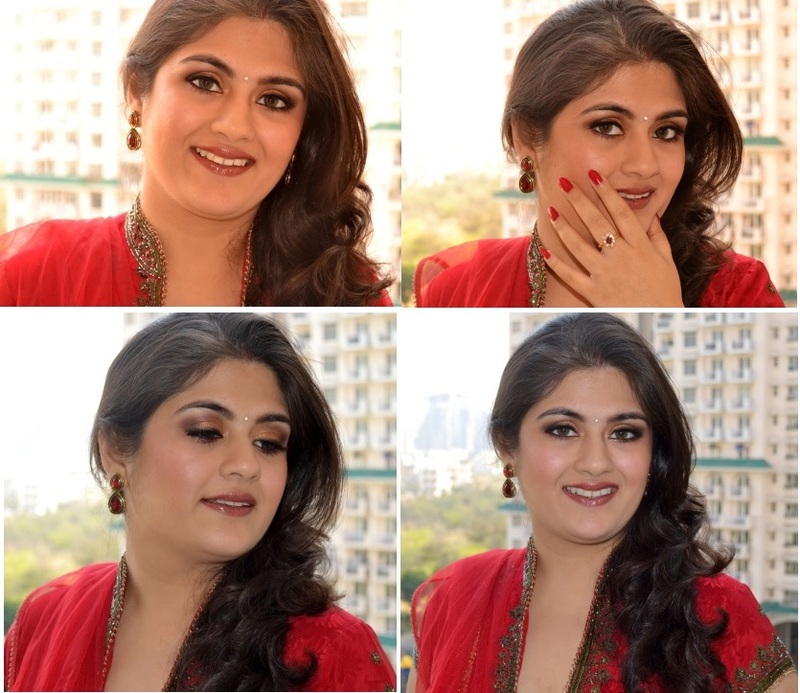 This look is for those Indian girls who wish to do their own bridal makeup. 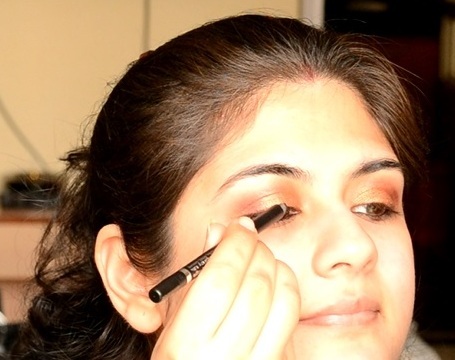 It’s great fun doing your own makeup as you can practice before-hand to help understand what will look best on you for the wedding. 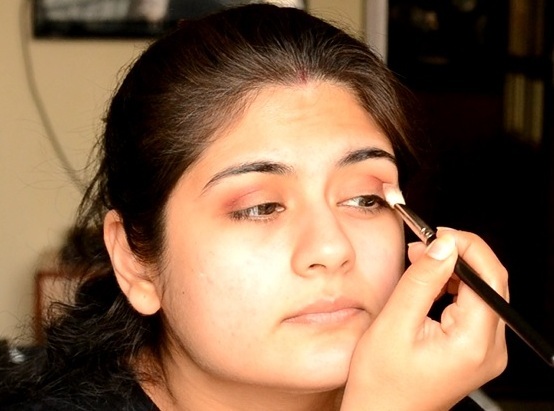 The key to any good bridal makeup is BLENDING! 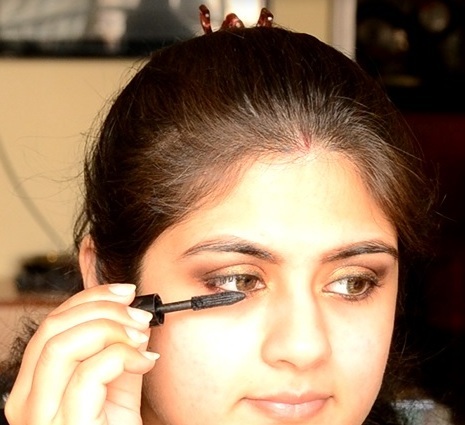 Hence invest in a good blending brush as you wouldn’t want to compromise on achieving a flawless look on your D-day! 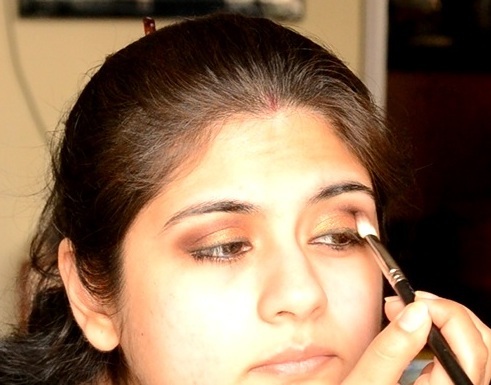 Step 1: I began with the eyes first as I was using a powdered loose eye shadow and knew there would be a few fallout’s. 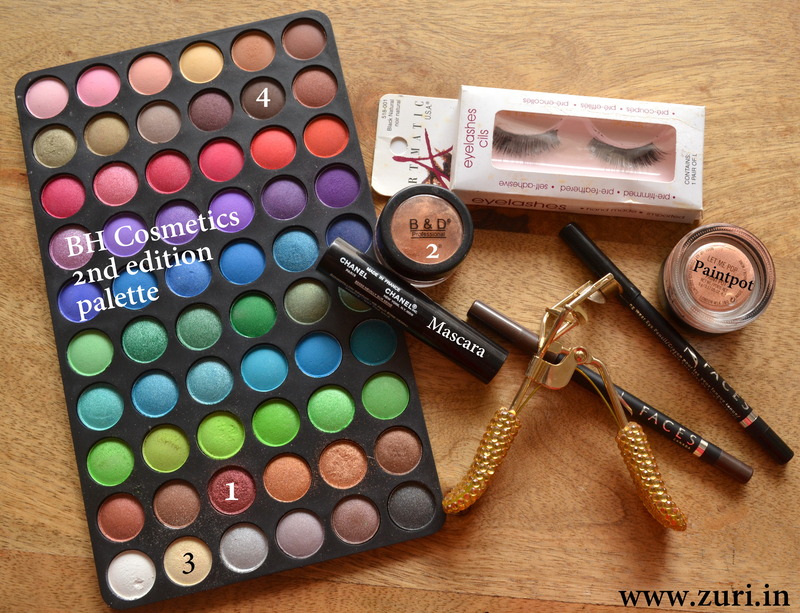 I applied an eye shadow base (MAC paintpot Let Me Pop) all over the eyelids for the eye shadow to stick on. 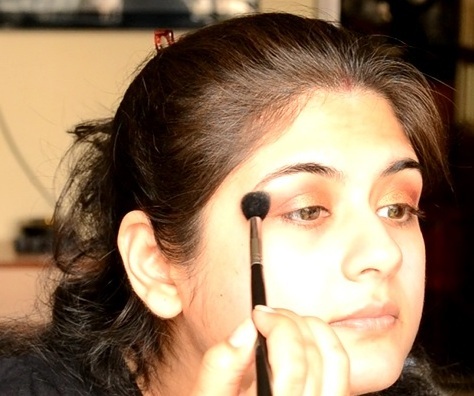 Step 2: Next, I applied a cranberry shade (shade no.1 in the image) on the outer 3/4th of the eye and took it up to the crease with a dome shaped blending brush. Step 3: Next, with the help of a flat eye shadow brush I took some of the powdered eye shadow (B&D loose powder-shade no.2 in the image) and broke the particles on a tissue and applied it from the inner corner of the eye until it met the cranberry color (shade no.1 in the image). At this time I also blended the two colors together. 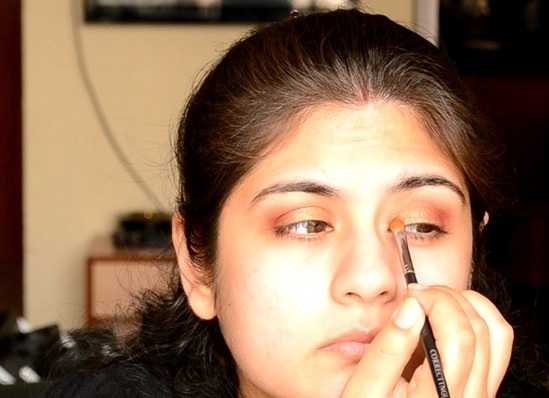 Step 4: Then with a clean blending brush, I applied a light shimmery gold color on the brow bone as a highlighter (shade no.3 in the image). 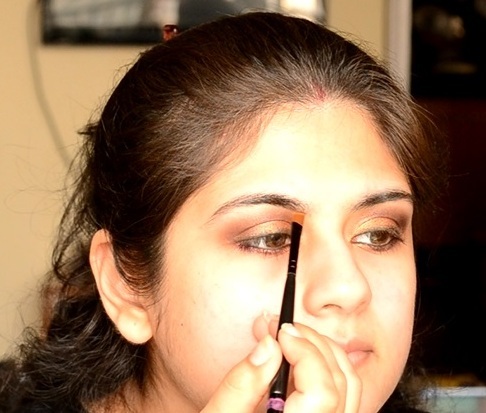 Step 5: Instead of using the conventional black for the kajal, I applied a brown shade (Faces brown) on the waterline. 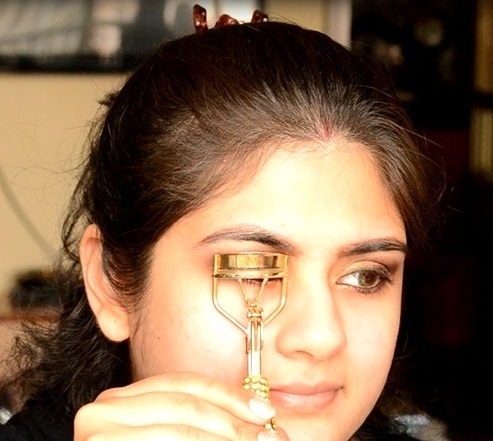 Brown is great for people who have small eyes as black kajal would make the eyes look smaller. 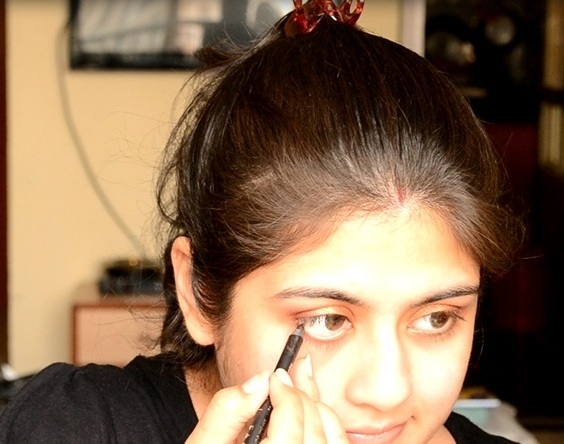 Step 6: Instead of going for the usual bold crisp liner, I used a black pencil (Faces solid black) and smudged it with an angled brush for a ‘not-so-prominent’ eyeliner look. Step 7: To intensify the crease a bit further, I applied a wee bit of black just at the fold and blended it with the cranberry so that it looked like a smooth transition. Step 8: Next with the same angular brush, I applied the cranberry color on the lower lash line making sure not to bring it till the inner tear duct area as the copper shade was going to go there. Any dark color, especially black, if dragged until the inside (inner corner of the eye) will make the eye look more ‘closed’ and small. Women with small eyes should refrain from doing this. Step 9: Time to fill in the eyebrows and give it structure and shape with a matte brown eye shadow (shade no.4 in the image) or pencil. 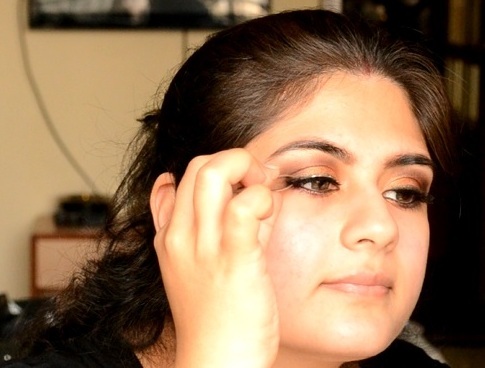 Step 10: Then I curled the eyelashes and added mascara (Chanel). Step 11: Finally I stuck some false eyelashes (Artmatic lashes from USA) to my original lashes and allowed it to dry after which I applied another coat of mascara over them to make them look more “together” and finished off by touching up the eyeliner. Moving on to the face – I first applied the face primer (MAC Prep+Prime) and massaged it with the hands for a minute. 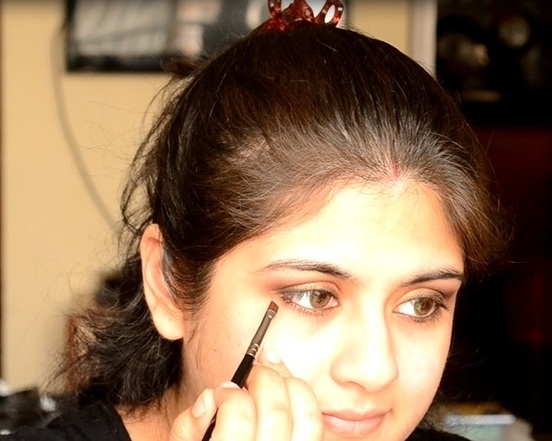 Then I moved on to apply foundation (MAC Studio fix fluid NC35) with a flat foundation brush as using a brush gives amazing amount of coverage. 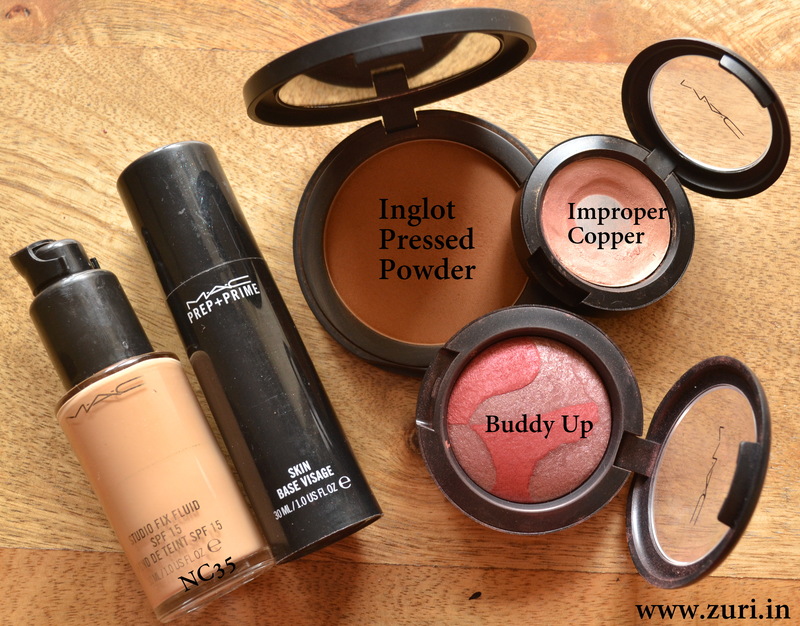 Since my skin was feeling a bit dry, I did not apply a loose/pressed powder after the liquid foundation. 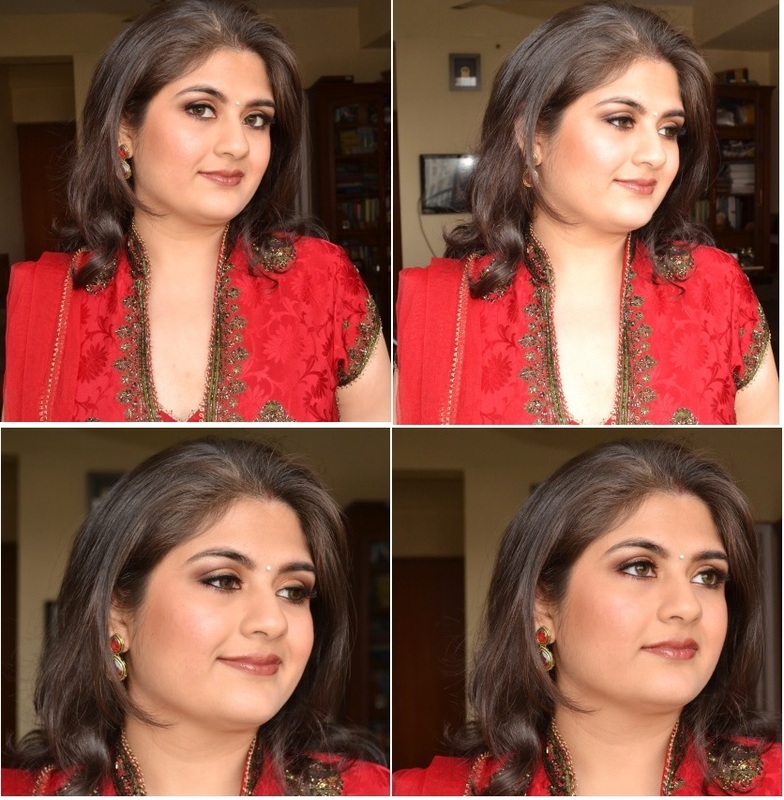 I straight moved on to contour the face (Inglot pressed powder), then some pink blush (MAC Buddy Up mineralized blush) and a copper-gold highlighter (MAC Improper Copper) on the cheekbones. I am wearing colored contact lenses in the shade of Green from the brand called Freshlook Blends which I purchased from Kapleshwar Optics. Hope you like the look. Don’t forget to leave a comment below and let me know what kind of look you’d like to see next!